I am excited today to tell you about a new eBook from Lauren Lanker of the Thinking Closet. I was lucky enough to read the book before it was even published and I can't say enough about how proud I am of Lauren. Thinking Outside the Gift Box: 21 Money-Saving and Meaningful Gift Ideas is so much more than just a how-to book. Lauren opens the door into her heart and shares stories of the most precious gifts she has received and gave over the years. From thoughtful notes to 12 preplanned date nights this eBook will inspire everyone. Each gift idea is inspired by a story. Often I would be reading through a section and the story would resonate with someone in my life the gift would be prefect for. I am a great DIYer and a great gift giver but not very often do I combine the two. I think it comes from being overwhelmed by Pinterest. The 21 ideas in this book make gift-giving simple. With 21 gift ideas and 73 actual gifts it will allow you to be creative and budget friendly while giving gifts for years to come. So what makes Lauren the master gift-giver? It has been two years since the Thinking Closet has launched and Lauren has over 60 gift tutorials on her website. Gifts that over the years I have made more than once (one of my faves Personalized Baking Dish that I have made for everyone in my family). What is the best part about this Lauren's eBook? She provides you with the tools you need to actually make the gifts and not just think about them. 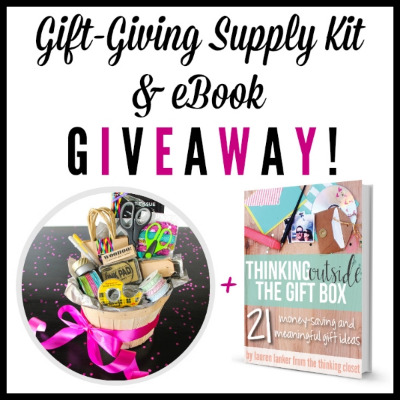 The eBook comes with a printables appendix to help you get a jump start on your gift making. This book will not only help you build up an arsenal of creative gifts but it will empower you to give a personable gifts customized for the receiver and become the ultimate gift-giver. The book covers gift-giving for all levels considering time, craftiness and budget. I am all set for the holidays and know that Thinking Outside the Gift Box: 21 Money-Saving and Meaningful Gift Ideas will be my go-to for gift ideas in the future. So pour a cup of coffee grab your tablet and settle in for an easy enjoyable read with Lauren, her family and her friends. Giveaway Rules: 1. This giveaway will run from now through 11:59 p.m. eastern on November 23th. 2. The full giveaway prize is open to U.S. & Canadian winners only; however, internationals are welcome to enter for a chance to win the eBook package. In the event an international winner's name is chosen, Lauren will email the eBook package to the international winner and draw another name(s) in order to find a U.S. or Canadian winner to whom to ship the Gift-Giving Supply Kit. That way, everyone can play! 3. Winner will be chosen and notified via email within 24 hours of giveaway’s end. Winner will have 48 hours to respond. Should the winner fail to respond within 48 hours a new winner will be chosen. 4. To read more fine print, click on the terms and conditions in the Rafflecopter widget. Cheers! Full Disclosure: I received a free preview copy of Lauren's eBook in order to share this review. However, all opinions are my own. I only recommend products or services I personally use and believe my readers will love.